Investors around the world went into crisis mode as British voters chose to leave the European Union in a stunning decision with far-reaching implications. U.S. stocks followed plunging global markets. The Dow ended the day down 611 points, or over 3.4%, while the S&P 500 lost 3.6%. The Nasdaq composite index dropped 4.12%, and into correction territory -- or down 10% from its recent high. The selloff might have been exacerbated with the vote results coming on a Friday. Investors are going into a weekend potholed with uncertainty. There's the possibility that other EU countries start pursuing referendum votes. And the dollar's appreciation against the euro and pound could cause China to devalue its currency, according to Jeff Kleintop, chief global investment strategist, at Charles Schwab. More exits out of the EU could challenge its institutions, such as the European Central Bank, which has played a huge role in the continent's tepid recovery from the global financial crisis. "You don't know what's going to happen over the weekend," says Kleintop. "Do we start to see a break down in Europe that would render the European Central Bank unable to conduct monetary policy?" The British pound plummeted close to $1.33, its lowest level in more than 30 years, as the results of the referendum became clear. It's now down around 6% near $1.36. The euro also fell heavily. Investors are already concerned about cash drying up in global financial markets. "Britons delivered a bombshell to the markets," says Chris Gaffney, president at EverBank World Markets, a firm headquartered in Florida. "This is the biggest risk to markets right now -- a possible lack of liquidity like we got during the Lehman crisis." In the final count, 51.9% voted to leave the union. Many investors had been betting on Brits choosing to stay. The surprise outcome caused immediate political shock waves, prompting Prime Minister David Cameron to announce his resignation. Jean-Claude Trichet, a former president of the European Central Bank, called the vote "an earthquake." Stocks got hammered amid the panicked mood. Shares in London got off to a brutal start before recovering some ground. The FTSE 100 ended the day 3.2% lower. A broad gauge of European blue-chip stocks index sank around 6.7%. Bank stocks took a particularly heavy hit as multiple lenders across Europe nosedived more than 15%. Central banks in the U.S., U.K. and the eurozone said they were ready to provide support as needed. After wild swings in Asian trading, Japan's Nikkei plummeted 7.9%. The Hang Seng in Hong Kong dropped 2.9%. U.S. stock futures are also sharply lower, with the Dow projected to tumble more than 500 points at the open. "Everybody's obviously a little bit stunned," said Andrew Sullivan, managing director of sales trading at Haitong International Securities in Hong Kong. "Equally, I think there have been people who are looking to take advantage of the situation as and where they can." 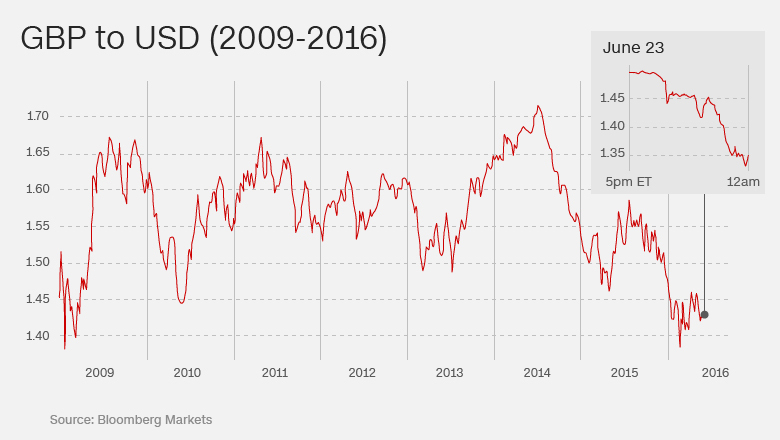 Investors turned to safe haven assets like the Japanese yen, which soared against the dollar. Gold jumped over 4%. "The markets have been betting on 'remain' in the past few days, and when the first results came in, that has reversed," said Vicky Pryce, an economist and former U.K. government official. Pryce was watching the results come in at the London School of Economics, where the mood was very nervous. Most of those attending -- and most expert economists -- wanted the U.K. to remain in the EU. They are worried "Brexit" could hurt the U.K. economy. "I've just seen my salary vaporize," Luis Garicano, LSE professor of economics and strategy, said as the pound tumbled after the first results were announced. It was an about turn for global stock markets. On Thursday, investors had been growing increasingly confident that the country would vote to remain a member of the 28-nation bloc. The pound made gains, and U.S. and European stocks rose. 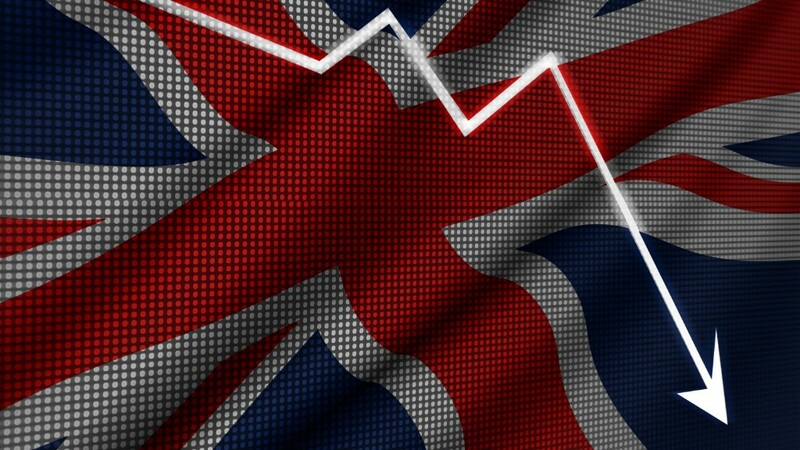 Concerns over Britain potentially choosing to leave the EU have caused turmoil in international markets in recent weeks. The FTSE 100 seesawed violently and the pound was more volatile than even during the 2008-2009 financial crisis. A record number of voters registered to vote in the referendum. Fierce campaigning has split the country down the middle, with opinion polls ahead of the vote too close to predict the result. Migration and the the economy dominated the debate. Campaigners for a British exit (Brexit) say the U.K. can only control immigration if it leaves the EU, which insists on free movement of people across the union. Campaigners for Britain to remain an EU member say walking out of the biggest free trade area in the world would do irreparable damage to the economy. -- Felicia Wong, Ivan Watson, Sophia Yan and Judy Kwon contributed reporting.